The photograph above is not the greatest quality, but it’s a photo I’ve never seen before. 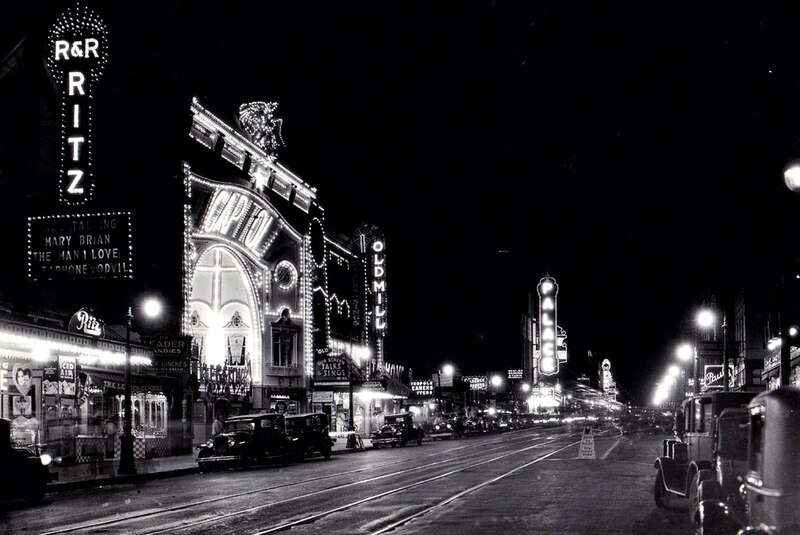 It shows the Palace Theatre in the 1600 block of Elm Street, just west of Ervay, with the well-known (and very large) Van Winkle’s Book Store in the background. One of the things that makes this photo so interesting is seeing the cumbersome support tower on top of the building holding up the ornate Palace sign. See what a slightly different Palace sign looked like the next year, lit up in neon, here. 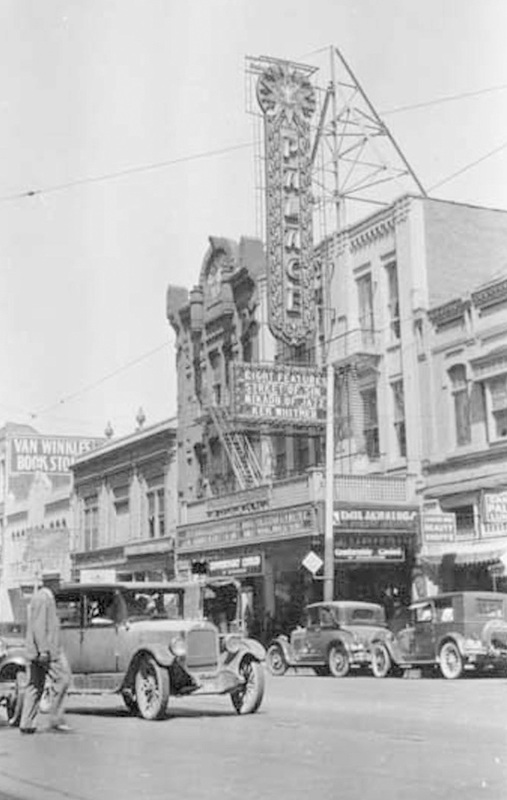 The photo above was an amateur snapshot, taken to document the tour of the traveling live stage revue The Mikado of Jazz which played the Palace in late May of 1928. 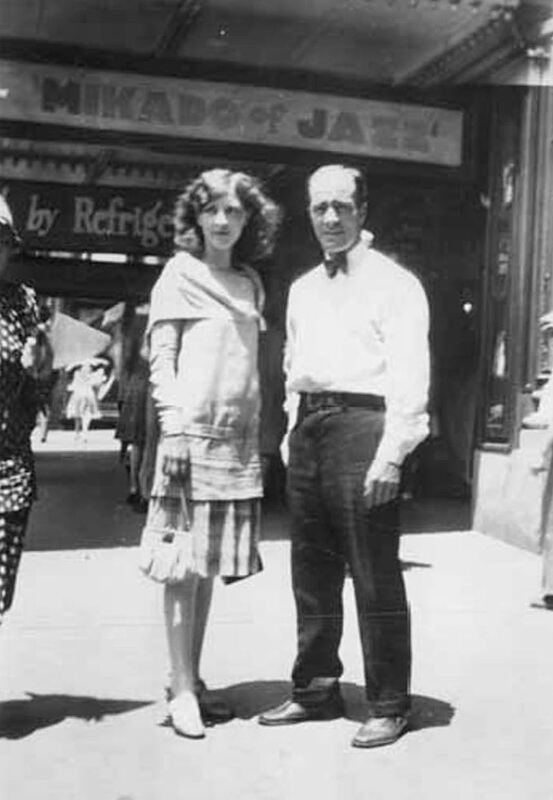 The photo below — which shows the revue’s stage manager and his wife standing on the sidewalk in front of the Palace — was taken at the same time. Scientifically correct the Palace ventilation system refreshes you with cooled breezes issued from the ceiling. You are not chilled! Also on the bill was the “world premiere” (?) 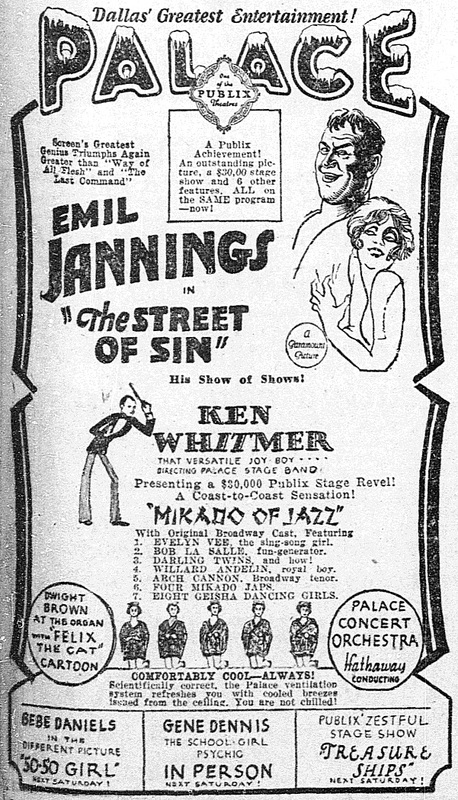 of the film The Street of Sin, starring Emil Jannings and Fay Wray, a live stage orchestra, an organ player, and a Felix the Cat cartoon. All at the Palace — “Dallas’ Greatest Entertainment!” Enjoyed at a comfortable temperature. Photographs (taken in May, 1928) are from the Rene Irene Grage Photograph and Ephemera Collection, 1921-1930s, University of Washington Libraries, Special Collections: more information on the first photo (the view of the theater from across the street) is here; more info on the second photo is here. Not only did you get the truly eclectic pairing of Emil Jannings and Felix the Cat on May 27, 1928, but there’s the promise of Dallas’ own Bebe Daniels in The Fifty-fifty Girl “next Saturday.” Bebe’s vehicle appears to be one of those fairly rare silent films that survives. The interesting street scene is new to my eyes too.